The legal status of online gambling had been somewhat confusing until recently, but with the 2014 gambling law the regulation is now clear, though not to everyone’s liking. In accordance with the current gambling legislation online gambling operators who wish to offer their services on the Croatian market must apply for an online gambling licence and pay the associated fee, HRK 3 000 000 (about $500 000). ** This fee is what incited protests from gambling operators, as they deemed the fee to be unreasonably high. There are, however, good news for Croatian gamblers as well: the government has decided not to seal off the online gambling market as, say, France did, but to allow players to mingle with those from other “open gambling” countries. Therefore, Croatina players have many online casino to choose from (see below). Casino gambling is legal in Croatia. Companies who wish to open a casino must apply for a gambling licence and pay the associated fee (note that this is different from the online casino gambling licence). There are currently about 20 casinos in Croatia, though there are also smaller gambling establishments where slot machines are available. Croatian casinos offer mostly the “traditional” casino games along with slot machines: roulette, blackjack and various forms of poker. Sports betting is also available at some of the casinos. Online casino gambling is also legal in Croatia. A new law regulating online casino gambling was introduced in 2014. In accordance with this law, online gambling operators must apply for a special online gambling licence and pay the licensing fee of HKR 3 million. As this regulation is rather recent, there are no reports yet on whether this is lucrative enough for online gambling operators (many believe that the fee is unreasonably high). Whatever the effect of the new online gambling regulation, locals are free to play on international casino sites as well. Bingo is legal in Croatia, and it is actually quite popular. According to the Croatian gambling laws, bingo is one of several lottery games, and is regulated along with lotteries. Knowing this, it shouldn’t come as a surprise that the Croatian national lottery operates bingo games in the country. Hrvatska Lutrija has a monopoly on all lottery games in the country, including bingo. Live bingo is generally played at licensed casinos in Croatia, though from time to time other establishments and organisations are given permission to hold bingo nights. The most popular form of bingo is the televised Bingo Show. Games of Hrvatska Lutrija are also available online, including bingo. As bingo is a state-monopoly, there are no other online (nor offline) bingo operators in Croatia. However, there are no laws against Croatian gamblers playing on foreign online bingo sites. Poker is legal in Croatia, but live poker games may only be held at licensed casinos. As poker is quite popular in the country, most casinos offer at least Texas Hold’em, and other variations are available at several casinos. These casinos host several poker tournaments along with the cash games, including the Eureka Poker Tour in 2013, organised by PokerStars. 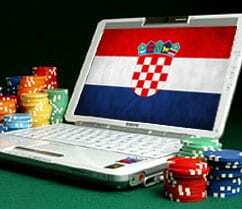 Online poker is also legal in Croatia, and is affected by the changes in gambling regulations in 2014. Previously tied to offline licences, operating online poker sites now requires acquiring a gambling licence and paying the associated fee only. As the regulation is rather recent, there are no online poker sites licensed in Croatia as of now. Locals are free to play on international poker sites though. It is important to note that Croatia has opted not to “fence off” their online poker market, but to let the players join the international crowd through future cooperations and by not blocking foreign online poker platforms. Sports betting is legal in Croatia. Sports betting had previously been a state monopoly and run by Hrvatska Loterija, the Croatian national lottery. Nowadays, however, there are several competing sports betting companies, though smaller sportsbooks have been pushed out of the market by increasing taxes. Apart from general sports betting, dog and horse race betting is also available. Several of the brick and mortar sports betting companies also operate online sports betting sites. The 2014 changes in gambling regulation don’t seem to apply to sports betting, which means online sports betting companies are not required to pay the new fees. Croatian gamblers may also freely access international online sports betting sites. Lottery is legal in Croatia and is a state monopoly. The Croatian national lottery is called Hrvatska Lutrija. Hrvatska Lutrija offers numerous games, including number lotteries, keno and bingo as well as sports betting. Lottery tickets can be bought at physical retailers and online as well. Hrvatska Lutrija also has an online casino section too. As lottery is a state monopoly in Croatia, it is illegal for other companies to operate lottery games whether offline or online. It is perfectly legal, however, for Croatian players to participate in international lotteries. Bitcoin gambling is not specifically regulated in Croatia. In accordance with the 2014 gambling law online gambling operators need a licence to offer their services within the country, and there have been no reports of licensed Bitcoin casinos. Still, locals are free to play on foreign Bitcoin gambling sites. The Croatian National Bank issued a statement in 2013 that Bitcoin is legal in Croatia. There are also Bitcoin traders where the Kuna can be exchanged for the cryptocurrency. This guide focuses on gambling and online gambling in Croatia. The different laws, regulations and licensing requirements affecting a casinos and online casinos registered in Croatia are also mentioned.